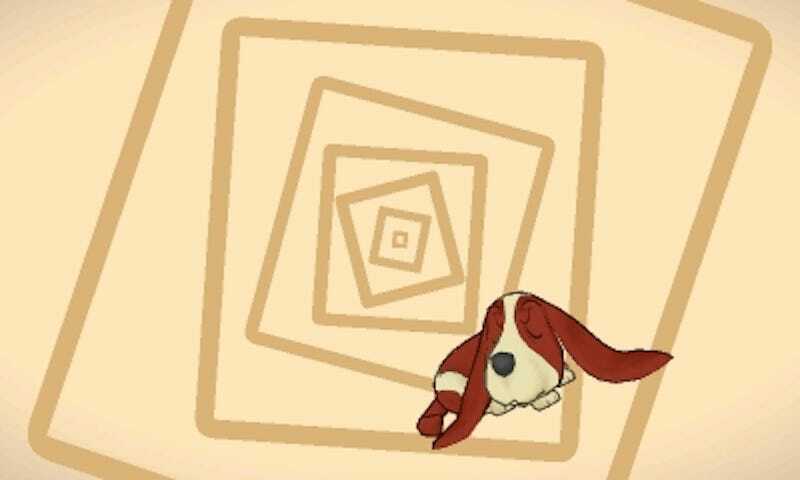 Sherl the dog from Layton’s Mystery Journey: Katrielle and the Millionaire’s Conspiracy, just before attempting to solve a puzzle. Here’s a puzzle: Why does a game that, DLC included, costs $39 on mobile in July cost $48 on 3DS in October? Background: The game in question is the puzzle-filled Layton’s Mystery Journey: Katrielle and the Millionaire’s Conspiracy. It’s the seventh major game in what used to be considered the Professor Layton series. Since this new one stars his daughter, the detective Katrielle Layton, let’s just call it the Layton series. Photographic Exhibit: The game’s official website seems to suggest that the DLC outfits that are paid for in mobile are unlockable via “special coins” in the 3DS version. Strange, given that the 3DS version charges real money for some of them. Special coins indeed! Clue #2: The 3DS version launched at $40, already $24 more than the mobile game, and $1 more than the mobile game with both DLC packs. Surely it included all that paid DLC for free, right? Clue #3: The first 10 pieces of the iOS game’s DLC—DLC Pack A—seem to be hidden in the 3DS version of the game as free content, though our resident puzzle-solver is five hours and three cases into the game and hasn’t found any of it. The instruction manual indicates that some outfits in the game can be obtained by “special coins known as fashion farthings” and says such coins are “rare.” We think those coins unlock those first 10 bonus outfits. Clue #4: The other collection of DLC--DLC Pack B—from the mobile game, is not included in the 3DS version. It’s for sale as paid DLC. The bundle costs $8, or you can buy the individual parts for $2 apiece. To get DLC Pack B along with the base game, that’d run $40 + $8 = $48. Investigation notes: A week ago, we asked a PR representative for the game why the 3DS game’s $40 base price didn’t cover all of the content in the iOS version, DLC included. We also asked why developer/publisher Level 5 seemed to be asking 3DS owners, who are already getting Layton’s Mystery Journey months later than mobile customers, to pay more for the same game. A week ago, the PR representative said they’d sent these questions to Level 5. A week later, despite follow-ups, we have no answer. Solved it? Write your solution in the comments below.